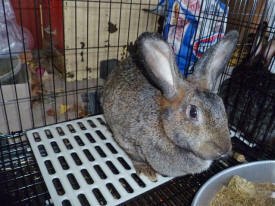 Well, Glenn decided he wanted to raise meat rabbits. 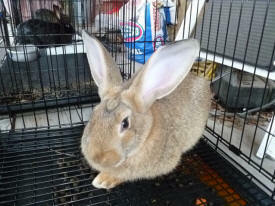 After much research on breeds, etc., he decided on TAMUK composite rabbits. They have been especially bred by Texas A&M University in Kingsville, TX to have larger litters, to tolerate our south Texas heat better, and to have tougher foot pads than most rabbits. The project was overseen by Dr. Steven Lukefahr. 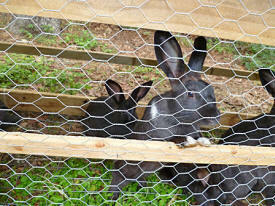 You can read an interesting article about these rabbits. They kindly bred both does to different bucks on the day they were picked up (Merlin is still too young to be a daddy!). You can read more about Merlin on this FaceBook page. 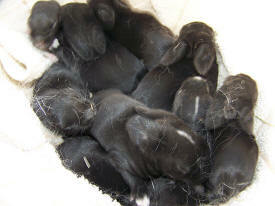 Lady of the Lake (bred to a chocolate buck) had nine kits 31 days later. She waited to pull hair until the night of the kindling, so we weren't even sure she was bred. She appears to be a good mother, even though it is her first litter. 02/16/16 - 9 days old: All nine are still doing great, and a couple of them have their eyes open. 05/08/16 - All nine grow-outs did well. They spent a lot of time in a tractor, trimming the grass/weeds in the front yard! 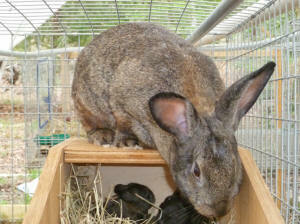 Lady of the Lake was bred to Merlin had eight kits 31 days later, one was born dead. She pulled very little hair, but is an excellent mother. 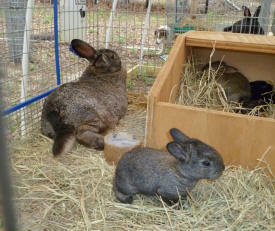 Everything given to her as a toy or snack (i.e., tp rolls, pine cones, etc) were taken into her next box for her kits. So - Merlin is PROVEN! Lady of the Lake was bred to Merlin on 06/01/16. Details to follow. 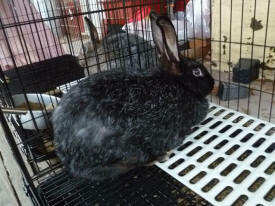 Morgana (bred to a blue buck) had 11 kits on day 32, one was born dead. She never did pull any hair, but did have them in the nest box. The kits were found dead the next morning, with two of them 'missing'... It looked like she didn't feed them. We don't know if she didn't have any milk, or just didn't know what to do. We're going to stick with three strikes before you're out, so she'll get another chance when Merlin is old enough. Morgana was bred to Merlin on 03/21/16. Nothing. Strike TWO. Morgana was bred to Merlin on 05/30/16. 10 born with no hair - dead. Strike THREE. Thank you for your interest; we have sold all the rabbits.